What is Statewide Water Planning? Managing and appropriating the state’s entire water supply is a daunting task; therefore, it is not controlled by a sole entity, but rather by various agencies, departments, and legislative groups that work together and share information in order to negotiate the responsible usage of water throughout the state. This coordination involves a complex system of rules and management authorities. The delegation of water management responsibilities to the various agencies and entities is determined by management goals (quantity or quality) and the location of water supplies (surface water or groundwater). 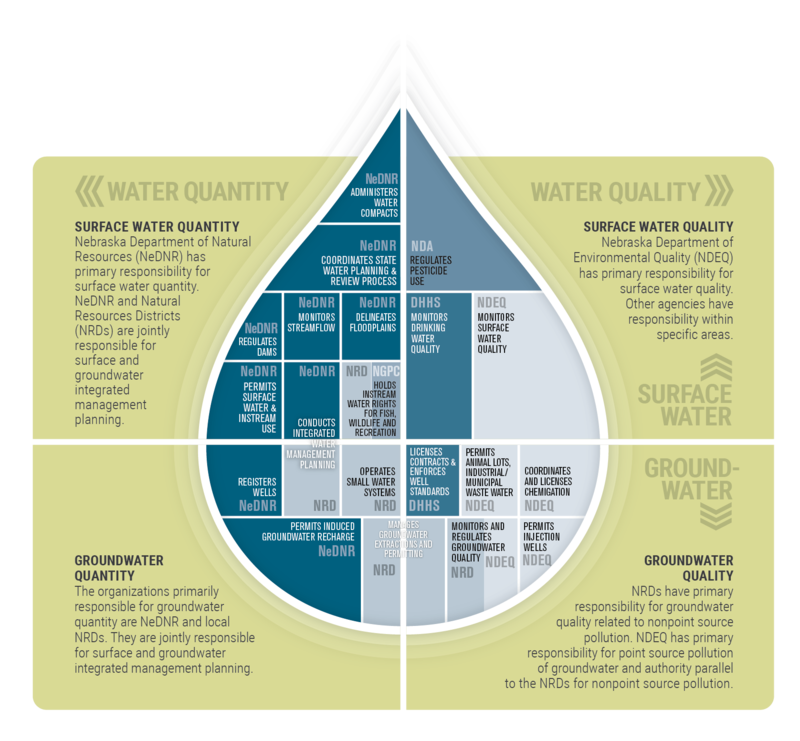 Roles and responsibilities do overlap due to the hydrologic connection of surface water and groundwater and the relationship between water quantity and quality. Communication between all agencies, entities, and groups involved is vital to successful water management. For more information on the delegation of agency responsibilities and specific roles, see “Who is Involved in Statewide Water Planning?” or click the water droplet figure. The Department of Environmental Quality (NDEQ) has primary responsibility for surface water quality. Other agencies have responsibilities pertaining to specific surface water quality issues. The natural resources districts (NRDs) have principal responsibility for groundwater quality related to nonpoint source pollution. NDEQ has primary responsibility for point source pollution of groundwater and authority parallel to the NRDs for nonpoint source pollution. The Department of Natural Resources (NeDNR) has chief responsibility for surface water quantity. The organizations primarily responsible for groundwater quantity are local NRDs and NeDNR, and they are jointly responsible for surface water and groundwater integrated management planning. NeDNR works with the NRDs to develop two types of water management plans: integrated management plans and basin-wide plans. Both types of plans are primarily focused on managing supplies of hydrologically connected groundwater and surface water. The difference is that an integrated management plan is developed jointly between NeDNR and a single NRD, whereas a basin-wide plan involves coordination between NeDNR and multiple NRDs within a basin. Some integrated management plans and basin-wide plans are required by the state, while others are voluntary. To learn more about where these plans are occurring in Nebraska, click the map images below. The Ground Water Management and Protection Act requires NeDNR to annually report its evaluation of the expected long-term availability of hydrologically connected water supplies. This annual evaluation is required for every river basin, subbasin, or reach that has not previously been determined to be fully or overappropriated or for which a status change has not occurred within the previous four-year period.